Let me get something through quickly. I love cheap collections of games, especially great nostalgic 1980’s games. I love old school arcade games that would magically make quarters disappear from my pockets with their simple and addictive gameplay. 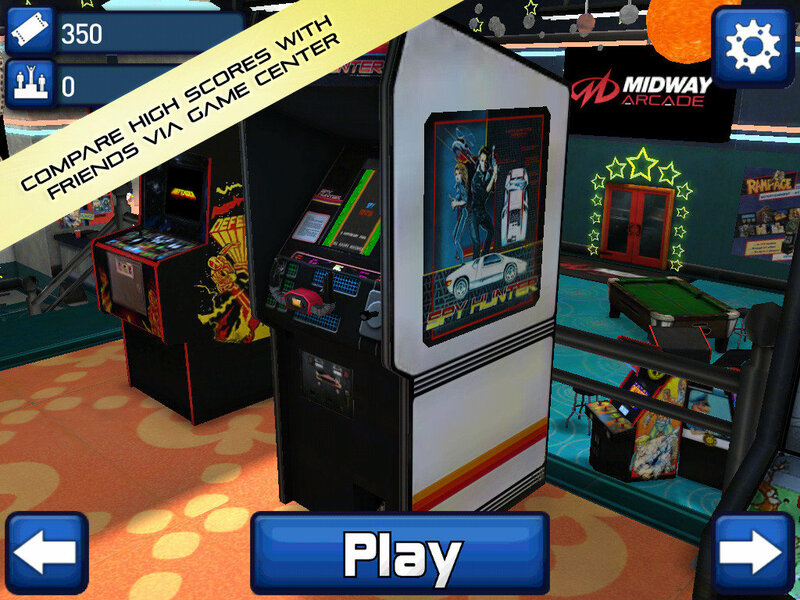 Enter Midway Arcade, a collection of 10 games that may or may not get your nostalgia glands to function in overdrive. These games are housed within a virtual arcade space that really captures the feeling of wandering a noisy arcade full of legendary 80’s games. Every game’s sounds, graphics and often stellar arcade cabinet art make my own nostalgia gland weep with pride. You can even turn the cabinets to get better views of the art if you like. Very nice little touch there. 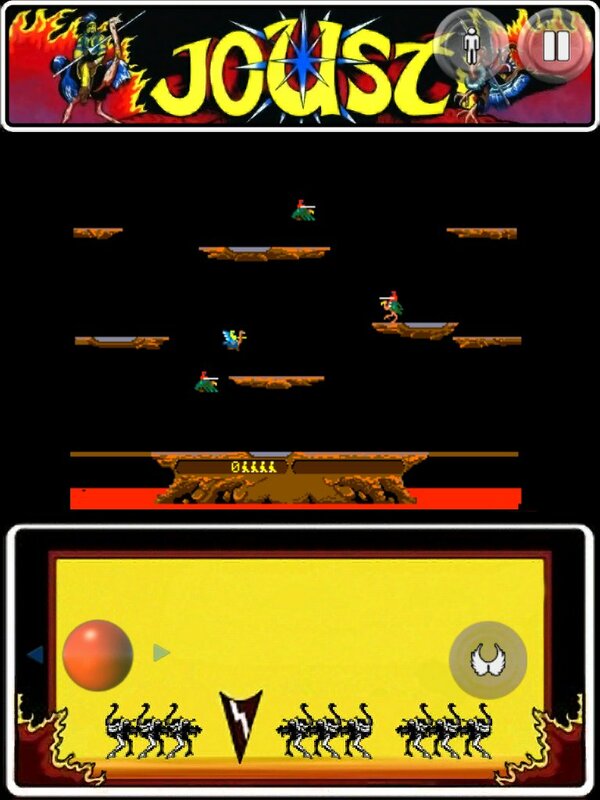 Now the game is advertised as “10 classic arcade games” but in reality it is six games that could qualify as “Classic” and four games that qualify as “Poorly realized arcade skill games that are done better by free offerings on the app store” but that is a bit long for ad copy, so they just say “10 classic arcade games”. So for $0.99, here is what you get, you lucky consumer you! Defender – A great port of the venerable 1980 scrolling and shooting spaceship game, until you take the touch controls into account. Then everything gets a bit wibbly. The game gives us a 8-way joystick for a game that had a very unique in control scheme (The original game forced the player to use one hand for elevation on a two-way joystick and then buttons on the sides to control thrust), so you often discover you aren’t pushing the joystick in the direction you had hoped when it is too late. This one doesn’t handle perfectly, but is quite playable. The game does offer tilt controls for thrust, but I found that to be more of a hassle than anything else. Joust – Ah Joust. A game everyone remembers fondly until they realize they were absolute rubbish at the game. Seriously, very few people can play this game well, I am certainly not one of them, but I do appreciate the space ostrich jousting and its place in history. The touch controls perform adequately and I can confirm I am as terrible at this version as I once was in the arcade. Spy Hunter – Spy hunter is a driving & shooting game originally played with a steering wheel and pedal. Here it can be played either with touch controls or touch and tilt controls. Strangely, I found the tilt controls to be more responsive than the virtual joystick option. Your Mileage May Vary of course, but with how fast Spy Hunter plays, you barely get time to think, so tilt just seems more natural. Rampage – This one I remember more from my NES-addicted youth days than actual arcade play. You play a monster destroying a city, smashing cars, eating civilians and just generally doing monster-y things. Again this one plays fairly well, however it does tend to often feel laggy on the controls, but from what I remember that is how the original was as well. So basically monsters, violence, destruction. Sold. Arch Rivals – It’s a Basket-BRAWL! Claims the art for this basketball game. Out of all the games, arch rivals probably plays the best with touch controls. I was able to play (and win) a couple games by smashing the opposing team in the face repeatedly until I had enough points to go home happily. The 8-way joystick works like a charm and even if you aren’t a fan of basketball, it is worth giving it a shot. Root Beer Tapper – Saving one of my favorites for last, Root Beer Tapper is a pretty amazing, yet simple game. You fill the mugs of everyone waiting for drinks at one of the 4 locations that range from a western saloon to an outer space alien bar. Don’t let a mug smash or the game ends! Unfortunately this port is simply horrendous. Instead of having a simple 4-way joystick and button to fill the mugs, the default 8-way joystick makes the game nearly unplayable as the game nears its middle and late levels. Precision is a must, and losing a second to a joystick that thinks you want to go Up-Left when you just wanted to go left really can set you back. The other four games are incredibly poor versions of skill games. 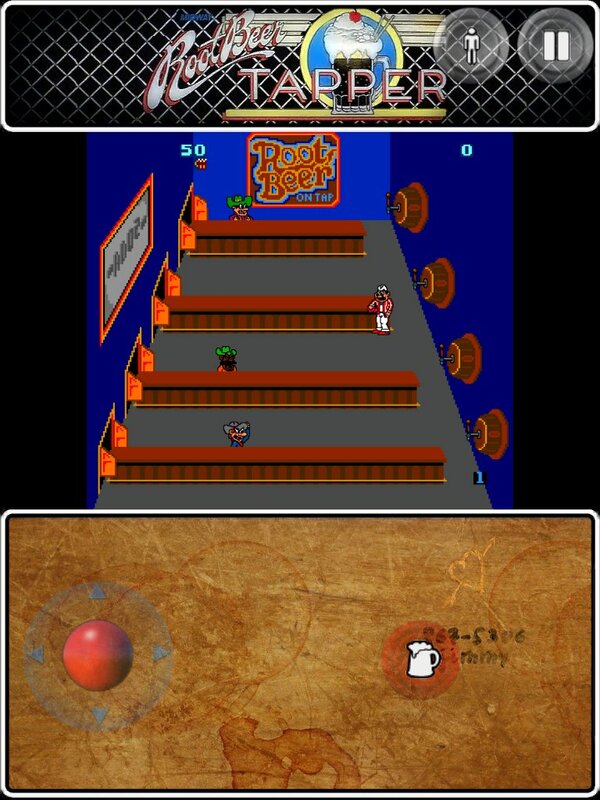 Arcade Basketball, Air Hockey, “Roll Ball” (Better known as the copyrighted Skee Ball) and Pool. All 4 of these games are pretty sad in both presentation and control, and very little effort seems to have gone into them, almost as if they were an afterthought. The good news is you don’t need to play them! All the arcade games award tickets when you finish a game, so enjoy the classics you purchased and ignore the “skill games” for the most part. The tickets are automatically used to unlock neat little gizmos and things that don’t really do anything but give you a sense of virtual pride. That is the core problem with this collection. The game selection is brilliant, they all emulate perfectly, and even the price is incredible, but until the controls are tightened up and iCade/joystick support is added in, it just drags the game down from “Must always play” status to “Play occasionally when bored”. As long as the game continues to be updated and expanded, I see Midway being a staple in my “Favorite Games” folder for a long time to come, but until the controls are updated, it won’t be played as often as I’d like.